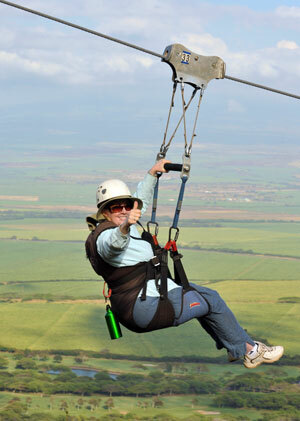 What makes your tour different from other zipline tours in Maui? First and foremost our tour is HUGE! 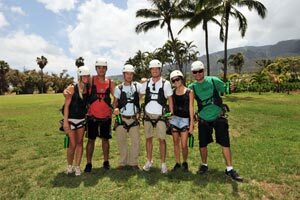 We have the longest zip line course and individual zip lines in Hawaii, with each participant zipping over 2.5 miles of the beautiful West Maui Mountains. 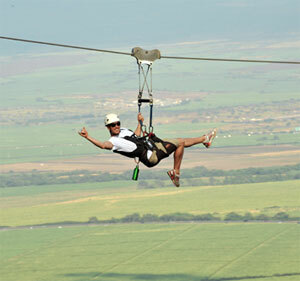 With heights over 250 ft. and speed in excess of 50 mph, Flying Hawaiian Zipline gives you a one of a kind experience. Each and every zipline is over a completely unique and different area; we do not zipline over the same gulch or valley! 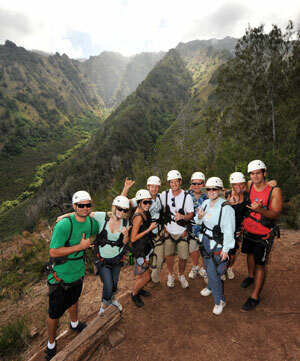 Our company is also a leader in sustainable tourism in Maui and our tour was designed to help the island thrive. 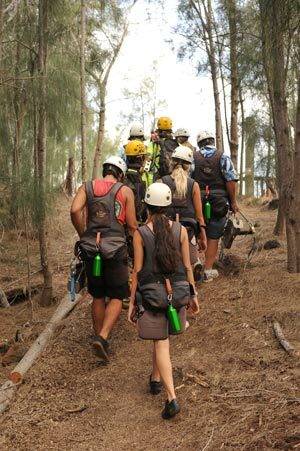 With every single tour giving back to the land, each person will be making a positive difference in Maui’s eco system. Our construction process was done without using heavy machinery so we would not leave any scars to Maui’s landscape. And finally, there is nowhere else on Maui with views like this! From start to finish, tours last approximately 4-5 hours. What should I wear? Participants must wear closed-toed shoes (Sneakers or tennis shoes are best). Sunglasses, comfortable clothing and sunscreen are highly recommended. Participants without eye protection will be issued mandatory safety glasses. A Camera/video if you would like however, we suggest one of the point-and-shoot varieties rather than one with a large, bulky lens. Backpacks are not recommended on the tour however, there is a small pocket on the back of your harness that can hold a small camera, car keys, cell phone, etc. You will also want to bring medication with you that might be needed at a moment's notice, like an EpiPen or asthma inhaler. 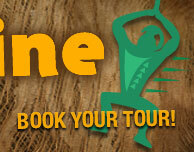 Any cancellations made within 24 hours prior to your day of departure will be charged full tour price. Cancellations of groups 6 or more require 72 hour notice and groups of 10 or more require 7 day notification or full charges apply. "No-shows" will also be charged full tour price. Participants must be at least 10 years of age and weight between 75-250 pounds. This policy is strictly enforced. Participants weighing outside this range will not be allowed to go and a full charge for that person will occur. What are the health, safety and physical requirements? Guests should be prepared for moderately strenuous activity, able to carry 10 pounds and be in good health. Participants will be required to hike short distances over slippery and/or uneven terrain. This tour is not suitable for those who are pregnant, have back or neck issues/injuries, experience dizziness, seizures, or any other serious medical condition. Reservations are strongly recommended as our tours can sell out days in advance (or weeks in advance during peak seasons). 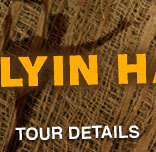 Our tours meet conveniently in Central Maui at the beautiful Maui Tropical Plantation. Only 15 minutes away from Kahului Airport and 30 minutes from Ka’anapali or Wailea. -Driving from Ka’anapali / Lahaina: Take HI-30 (Honoapiilani Hwy) southeast toward Dickenson Street and Lahaina (ocean will be to your right) Continue on the highway past Lahaina for approximately 19 miles. 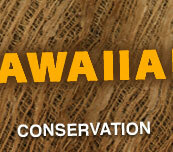 We are located on the left hand side of the highway approximately 3 miles past the Maui Ocean Center/Ma’alaea Harbor. -Driving from Kihei/ Wailea: Take HI-31 (Piilani Hwy) through Kihei. Turn left at North Kihei Road continuing to Ma’alaea Harbor (ocean will be directly to your left) Turn right onto HI-30 (Honoapiilani Hwy). We will be on the left approximately 2.5 miles after the turn. Yes, all participants must sign a waiver before participating in the tour. The waivers are provided at check-in. Guests under 18 years of age must have a legal guardian signature before zipping. For a copy of our waiver please click here. In the event of rain or severe weather, such as lightning or sustained high winds, we may choose to cancel your tour. 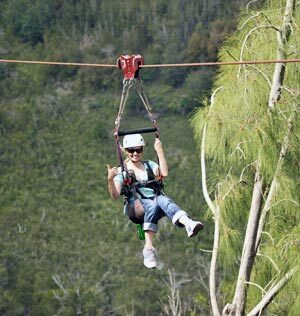 Flyin Hawaiian Zipline reserves the right to cancel tours due to inclement weather, foreseeable hazards or events beyond our control. If we know in advance that we will be closed, we will try to contact you at the phone number you provided to us when you booked your tour. If your tour is cancelled due to weather, we will do our best to reschedule you for a different day, or we will refund your tour cost. No prior experience is needed. Our highly trained guides will fit you with state of the art equipment and ease you into the course with a training session where everyone will practice with the equipment and learn the techniques before embarking on the tour! As our course zips all the way across a mountain range (not in a circle) only those who are on the tour can go along. Do you provide a meal? There are no major meals served however, we do provide water, light granola snack and juice for you. What about tipping the guides? Of course tips are not mandatory, but your tour guides do work very hard to ensure you are safe and that you have a great time so they do appreciate any gratuity. Yes, of course however, we do ask that you share your photos with us on Facebook! Point-and-shoot hand-held cameras work best and are easily stored in a pocket on the back of your harness. 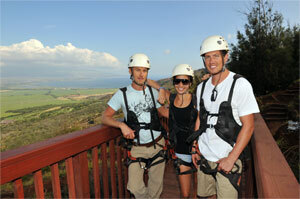 Flyin Hawaiian Zipline is not responsible for and cannot recover any items dropped from the course. I'm coming in on a cruise ship…how far are you from the harbor? We are approximately 15 minutes from Kahului Harbor and are easily accessible- either by cab ride or by renting a car. For those docking in Lahaina, we are approximate 30 minutes away. Please keep in mind that Lahaina is a tender port and you will need to plan extra time for the tender boat to take you from the ship to the shore.